The Deputy Mayor, fellow town councillors and invited guests attended a ceremony on Saturday [13 October] to celebrate the Western Road Recreation Ground’s recently gained Fields in Trust protected status, at which a plaque was unveiled to mark the safeguarding of the site for recreational purposes in perpetuity. Hailsham Town Council was successful in its funding bid earlier this year, having been awarded £5,000 by the London Marathon Charitable Trust as part of The Active Spaces programme delivered in partnership with Fields in Trust. 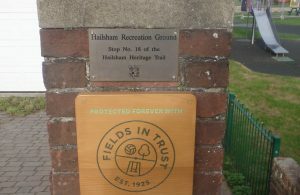 The Town Council has since worked with project partner Hailsham Active (formerly Hailsham & District Sports Alliance) and Our Parks to deliver and operate the Hailsham Active scheme, inspiring the local community to get active and take part in exercise programmes on the site which is now legally protected for future generations to enjoy. Launched in April of this year, Hailsham Active provided free and easy access to low-impact exercise at the recreation ground on Saturday mornings for people aged 16+ in the local community, though focusing on the over 55s. Exercise sessions have now been transferred indoors from the recreation ground to the recently opened James West Community Centre in Brunel Drive. Sessions now take place on Tuesdays from 6.30pm-7.30pm and further sessions are scheduled for Saturdays from 9am-10am and 10am-11pm, commencing 3rd November. Free Fitness in the Park for Hailsham Residents!